Spiritual Spectra is a spiritual and holistic healing practice offering an array of services that increase wellness through the mind-body-spirit connection. Our mission is to heal, offer guidance and closure so you may live a happier and healthier life. Spiritual Spectra’s services include Spiritual Tarot Consultations, Medium Readings, Energy Healing, Corporate Wellness, and more. We offer a variety of workshops and events including our Meditation Circle and Messages from Spirit. Please tour our website to see all we have to offer. Jennifer Garcia, Founder of Spiritual Spectra, was interviewed by the Baltimore Sun and quoted in the article entitled “Take Peaceful Journeys for Your Mind’s Health” on February 1, 2019. 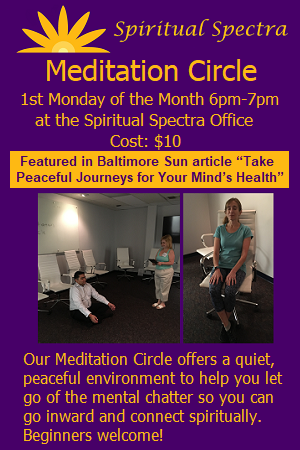 Spiritual Spectra’s Meditation Circle was featured in the article. Jennifer Garcia, Founder of Spiritual Spectra, was invited to give Psychic Readings for the cast of the Mix 107.3 Radio Station Jack Diamond Morning Show live on the radio on March 15, 2018. Contact us to schedule an appointment or hire us for an event.